This edition is LIMITED to only 231! "As I painted my homage to this amazing story, I could not help but be moved by the intricate interplay between all of the magnificent creatures under Simba’s domain. I imagined a lush, colorful, and bountiful African plain rightfully reestablished to its splendor after Simba vanquished Scar and his comedic, yet treacherous, hyenas each now forlorn in their punishment. 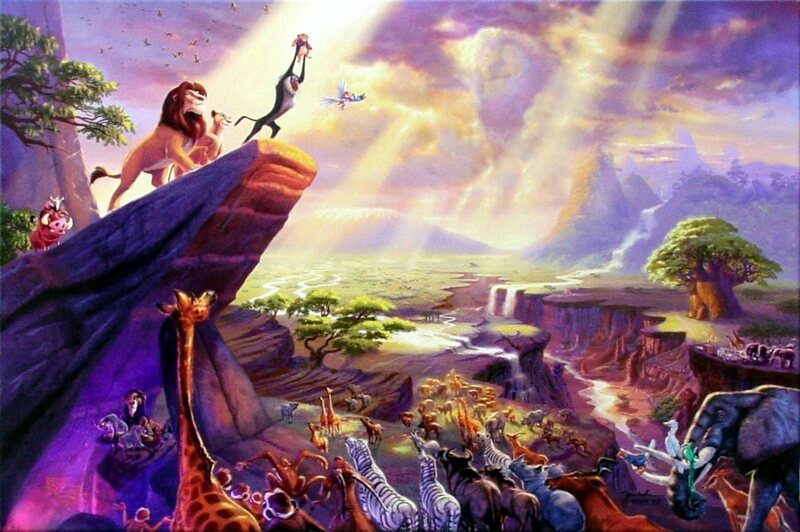 The multitudes of animals have been summoned to pay tribute to Simba’s new baby and their future regent as they wait under a spectacular sky illuminated in great anticipation. The world is as it should be…in harmony and perfectly balanced. Simba’s heir is exalted by Rafiki and proudly symbolizes what awaits when destiny is embraced, challenges faced, and one summons the courage to stand in the spotlight of providence. I trust that this image will both remind you of this fantastic story and its amazing characters and, most importantly, move you to face the future irrespective of history’s impasses knowing that the watchful and approving eye of the King is content as you embrace your place in the circle of life."